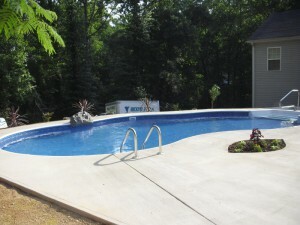 Gunite swimming pools are the perfect way to get the most unique pool in Spartanburg! Gunite Swimming Pools in Spartanburg – It is a pretty common dream to want a swimming pool for your Spartanburg, South Carolina home. The tricky part can be deciding which type to get. When it comes to an in-ground swimming pool, two options to consider are a traditional poured concrete pool and a gunite swimming pool. At Ricky’s Pools, we offer both types, and we are finding many homeowners are enjoying the versatility of gunite swimming pools for a number of reasons.